Dental Implants in Alberta, Dental Implant Costs, Leigh Smile Center, Low Cost Implants. PROVIDING ALTERNATIVES FOR THE REPLACEMENT OF MISSING TEETH. We are located 50 minutes north of Edmonton in WESTLOCK, ALBERTA, but we serve patients from Edmonton, Calgary, St. Albert, Red Deer, Fort Saskatchewan, Sherwood Park, Slave Lake, Fort McMurray, Peace River, Grande Prairie, Spruce Grove, Westlock, Barrhead, Whitecourt, Camrose, Wetaskiwin, Swan Hills, Edson, Athabasca, and other communities in Alberta. 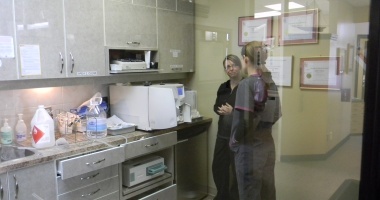 Many of our patients come to us from other Provinces such as B.C., Ontario, and Saskatchewan. We even have patients from outside of Canada. Alberta Dental Association & College Dental Fee Guide. All other fees related to the complete Dental Implant treatment are explained on the "IMPLANT FEES" page. $3,990 Includes the Implant Surgery, Zirconia Ceramic Crown, Implant Abutment/Post, Laboratory Fee, Surgical Guide, Diagnostic Study Models, and any extra radiographs required. Does not include Bone Grafting if required. See our 'Dental Implant Fees' page for information on Alberta Health Care's partial coverage of Bone Grafting. Our "Fees" page will provide you with the information about the availability of BONE GRAFTING procedures that you may be eligible for through Alberta Health Care. Additional Implants/Crowns are $3,190 each (in the same arch, on the same surgery date). If the second or more implants are in a different arch, the price will be $3,590 each for the first implant, and $3,190 for the second or more implants. SEE OUR NEW LOWER 'ALL-ON-4' OR 'ALL-ON-6 HYBRID FULL-ARCH APPLIANCES. If you are seriously considering dental implants, you should do some comparative shopping. Compare prices in terms of the TOTAL fee ... not just the placing of the titanium implant. For instance, does the fee include the 'Standard of Care' CBCT SCAN (3-D X-ray) , the Minimally Invasive Surgery Technique SURGICAL GUIDE, the Consultation Fee, any additional radiographs, a Zirconia Ceramic Crown, the Abutment/Post, and the Laboratory Fee? You may find SIGNIFICANT differences in prices from dental office to dental office when you compare 'apples to apples'. Our fee is ALL INCLUSIVE. See our "FEES" page for more Information on Bone Grafting that may be covered by Alberta Health Care.. THE ABOVE $1,000 FEE DOES NOT INCLUDE THE RESTORATIVE PHASE. For complete details, including the costs associated with the Restorative Phase (dental abutments, crowns, bridges, implant overdentures, and implant titanium frameworks), please see our "FEES" PAGE. For example: A single Implant with abutment and crown, complete, at the Leigh Smile Center costs $3,990. This includes the dental implant, the implant abutment or post, the final implant crown, and the surgical facility fee. Additional implant crowns, complete, are $3,190 each (in the same arch, on the same surgery date). If the second or more implants are in a different arch, the price will be $3,590 each for the first implant, and $3,190 for the second or more implants. The 3-D X-ray and the surgical guide are included in the fee. Before any Dental Implant procedure, we provide potential patients with a Dental Implant Consultation. In the past, as a benefit to our patients, our dental implant consultations have always been 'complimentary'; however, the Alberta Dental Association & College no longer allows Alberta Dentists to advertise or provide "Free Dental Implant Consultations" to Albertans. 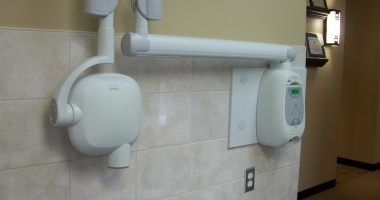 In order to comply with the ADA&C's Regulations, we are charging the Dental Implant patient a $100.00 Consultation Fee. There is also a $300 fee for a CBCT 3D Scan. PLEASE NOTE: If the patient proceeds with the Implant Placement and Restoration at the Leigh Smile Center, the $100 Consultation fee and the $300 CBCT Scan fee is INCLUDED as part of the overall price ($3,990). This represents a LARGE SAVING to the patient. If not, we will be happy to provide you with a copy of your scan. We stand behind our work. Some dental implants do fail; however, this is rare. If they do fail, Dr. Leigh will refund the $1,000 Dental Implant placement fee or replace the implant at no additional charge, within one year of the initial surgery. 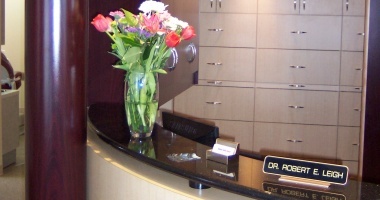 Welcome to the Leigh Smile Center website for information on Dental Implants. 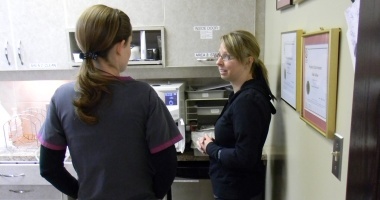 Whether referred by a Dentist in Northern Alberta or the Edmonton area for dental implants or cosmetic dentistry, or you just want general information, our friendly and professional staff will do their utmost to make your visit as comfortable and positive as possible. 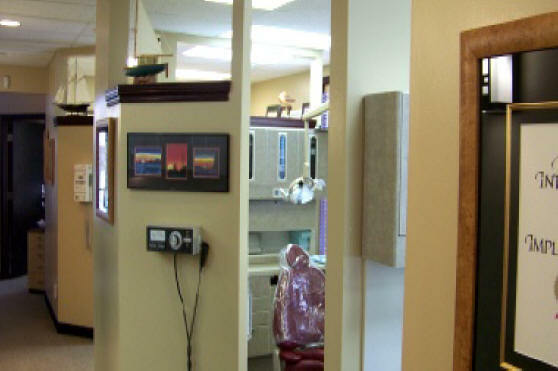 The Leigh Smile Center is a full service dental office, providing a full range of general dental services. Dr. Leigh offers the placing and restoring of Dental Implants as a service in his practice. We are very happy that you have chosen to visit our website for information about Dental Implants. 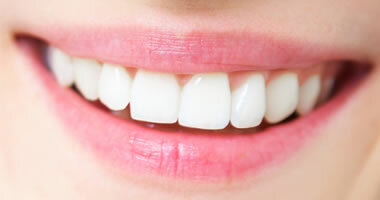 In this site, we have attempted to provide you with the most recent information about the advances that have been made in the area of Dental Implants over the past two decades. We look forward to hearing from you, and assisting your dental implant needs. 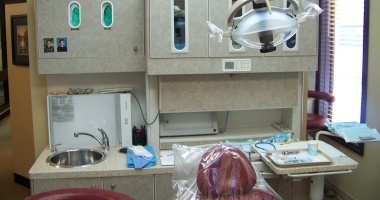 Dentists provide a valuable service to the public. That service should come at a reasonable price. We believe it is important that consumers/patients be fully informed and knowledgeable about any medical or dental procedure that may affect their health. 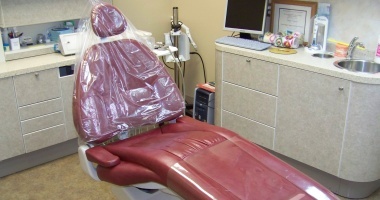 As a recent investigative TV program has shown, costs for dental procedures in Canada can vary widely. It is always wise to do some research in order that you can ask the most relevant questions of your Dental professional. An informed consumer is a wise consumer, and we make sure that our patients are made fully aware of each and every aspect of the procedure, including costs and aftercare. The Internet is an excellent source for dental information, and we hope that our site will be helpful in your decision to have dental implants placed. Since cost is one of the major factors in the decision to have Dental Implant procedures, we make it our policy to be completely transparent with all our patients, so that there are no 'surprises' or hidden costs. 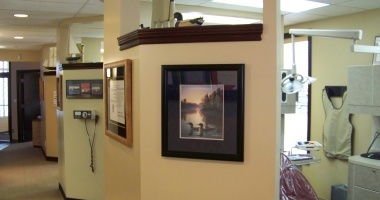 At the Leigh Smile Center, Dr. Leigh performs both the placing phase (inserting the implant into the bone) and the restoration phase (attaching the abutment and the crown) of Dental Implants; or, in the case of implant dentures, attaching the bar, or framework, that will support or stabilize the dentures. If you are considering dental implants, you have probably heard the terms "Teeth-In-1-Day" and "All-Over-4" TM (Implant Direct), or "Teeth-In-A-Day" and "All-On-4" TM (a Nobel Biocare trademark). We want you to understand what these manufacturer's slogans mean, and what those procedures entail. What PATIENTS NEED TO KNOW about the "TEETH-IN-1-DAY" PROCEDURE. Patients and consumers should be aware that there are no Dental Implant "Specialists" in Canada. To date, the Alberta Dental Association + College, and the Canadian Dental Association, do not recognize Implant Dentistry as a "Specialty" area of Dentistry. No Dentist in Alberta is allowed to tell patients that they are a "Specialist" in Dental Implants, or that they "specialize" in Dental Implants. This would be a direct violation of the ADA+C's Code of Ethics. Dental Implants are a service that Dr. Leigh (a General Dentist) offers at his Center. 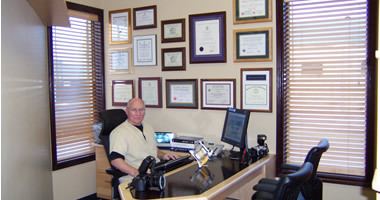 He has been both placing and restoring Dental Implants throughout his dental career. Recently, The Royal College of Dental Surgeons of Ontario (RCDSO) has established guidelines and educational standards specifically for Dentists who intend to perform dental implant procedures in Ontario. Other provinces will probably establish the same or similar standards. According to the RCDSO, "The provision of dental implant treatment requires a specific base of knowledge and clinical skills for both the surgical and prosthetic phases of treatment." The RCDSO also states "The level of complexity of the cases dentists elect to undertake should reflect the commensurate level of training and courses they have successfully completed and competency and experience they have acquired." 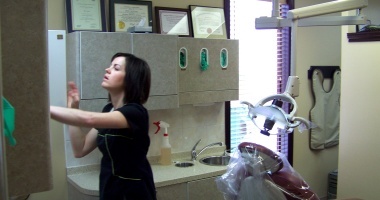 With the proper training, all Dentists in Alberta (General Dentists and Specialists in other Dental fields, e.g. Oral Surgeons, Prosthodontists, etc. ), can perform Dental Implant procedures, but they cannot say that they "specialize" in dental implants, or are "Specialists" in Dental Implant procedures. Dr. Leigh 's referral-based practice is limited to Full-time Implant Placement, Restoration, associated Bone Grafting, related care, and Teaching. As you continue through the website ("Fees" Page) you will find the FOUR VERY IMPORTANT QUESTIONS you should ask any Dental professional who may be performing the Dental Implant procedures. It is important also to ask for a "fee quote" that includes every aspect of the procedure ... not just the cost of the placing of the dental implant and the dental implant itself. There can be a significant difference in cost among those providing the service, or aspects of the service (such as only the placing or only the restoring of the dental implant, or both ... so, it is VERY IMPORTANT to obtain a complete fee quote, as well as information on the experience of the Dentist with whom you intend to place your confidence. For the most part (in terms of material and manufacturing) all dental implants are virtually the same. Different companies make different versions of implants. According to a recent study, there are approximately 1300 different types of dental implants world-wide. 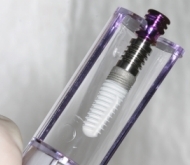 The implant is a small screw-like object, made of medical-grade titanium, that has a rough surface or a special coating that helps the implant 'osseointegrate' with the bone. All implants in Canada must be government approved for use in the Dental profession, and adhere to Health Canada regulations and guidelines. The Alberta Dental Association + College does not allow Dentists in Alberta to Warranty or Guarantee any dental treatment or services. For more in-depth information about Dental Implant procedures, and fee comparisons with the Leigh Smile Center, you may want to visit the United States' Clear Choice website: www.clearchoice.com. You may have seen the Clear Choice Implant advertisements on TV. Any of the procedures that you see on the Clear Choice website are ones that we perform regularly at the Leigh Smile Center. Dental Implant Costs, Tooth Replacement, Dental Implants in Edmonton, Dental Implants in Calgary, Dental Implants in St Albert, Dental Implants in Red Deer, Dental Implants available in Alberta, Low Cost Dental Implants, Denture Implants, Dental Implant Prices, Dental Implants Dentist, Cost of Dental Implants, Information for Dental Implants, All-Over-4, Teeth-In-A-Day, Dental Implants British Columbia, Dental Implants Saskatchewan>, Teeth Replacement, www.leighdentalgroup.com.